Different beliefs and practices between Roman Catholics and Protestants have created divergent views regarding sacred art and architecture. Protestants seem to lack an appreciation, if not a category, for sacred aesthetics. By contrast, the Roman Catholic Church actively emphasizes aesthetics. Taken to extremes, both approaches can lead one away from the true worship of God—Protestants can retreat into worldly pragmatism, and Roman Catholics into ornamentation and ritualism. Architecture by itself has nothing to say about the heart of a worshipper. But as a Protestant, I want to investigate the reason why we tend to place a low value on sacred architecture—resulting in generally poor modern churches—and why we often view Roman Catholic sacred aesthetics as impractical (if not idolatrous). Some of this goes back to the Reformation itself, or even beyond to the long history of iconoclasm in the Church. But there are a number of present-day, interlinked worldview elements in contemporary Protestantism, particularly Evangelical Protestantism, that contribute to what we see architecturally. I will explore these for their impact on aesthetics, with the caveat that I am not intending to write a theological treatise. 1. Low view of the church and place. The Roman Catholic tradition emphasizes the big-C Church—the one, holy, catholic, and apostolic Church of the creeds—with the local church as a mostly standardized operating subsidiary. By contrast, most Protestants emphasize the small-c church, their local congregation. This is truer than ever, as demonstrated by the rise of non-denominational churches. This produces a system with no theology of place. Protestants feel a sense of duty to the place and community where they personally live. But if the majority of church members move, say, from the city to the suburbs, then a new church building can be constructed, the old building sold, and the duty transferred to the new place where the members now reside. The original building only served a pragmatic purpose as meetinghouse for the members. The Roman Catholic Church views its remit as covering the entire globe. So when there is population change in a locale, the church is not relieved of responsibility for it. The church building is an outpost of Christianity in a particular place (the parish concept), not just to a group of people. 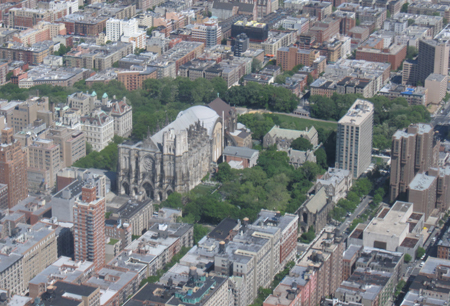 In short, Protestants see place as ephemeral, while Roman Catholics see it as permanent. 2. Dualistic view of spiritual and physical. Modern Protestantism tends to see the spiritual as distinct from the physical, with the true Christian life being inward and spiritual. But in the historic orthodox view, spirituality is embodied, just like Christ. This is generally under-appreciated in Protestantism, which can take a vaguely Gnostic view of the physical. We can treat physical aspects of reality as unimportant or potentially even taboo. This is evident, for example, in the near-practical elimination of the Eucharist in post-Reformation sectarian groups that have broken off from the mainstream Lutheran, Anglican, and Reformed traditions. The debate over the relationship of the physical and spiritual emerged early in the church. Second-century Church Father Irenaeus strongly maintained that the Church was a physical entity in the real world—Christianity was not merely a set of cognitive beliefs that were intellectually agreed to. Since the time of Augustine, who built upon Irenaeus, the Western Christian tradition has had a deeply rooted theology of participation. Put simply, while God is not the creation (pantheism), He is intimately tied to and involved in it (omnipresent). In Western Christianity, there is a “sacramental” quality to the entire creation—yes, even in buildings. If spirituality is not seen as embodied, but instead the physical is separate from and inferior to the spiritual, then sacred architecture becomes unimportant, and an excessive focus on it can be seen as outright worldly, much like the pursuit of riches. 3. A theology of “imminence.” Many contemporary Protestants hold to a dispensationalist premillennialist eschatology. In this view, God’s covenant with the nation of Israel is distinct from that with the Church. Old Testament prophecies must be fulfilled, specifically regarding the Jewish people. The reestablishment of the state of Israel in 1948 produced fervor about the end times because it seemed those prophecies were indeed being fulfilled. While this view has been somewhat in decline, a general obsession remains. For example, the “Left Behind” series of novels, which describes the world after the Rapture, has sold over sixty million copies. The danger of an excessive eschatological focus has been known since at least the time of Paul (2 Thessalonians). He links this to a neglect of the physical, such as people giving up work in anticipation of the return of Christ. The Thessalonians are strongly rebuked for both this excessive focus and physical neglect (e.g., “If any would not work, neither should he eat.”). This same effect is evident in contemporary Protestant church buildings, whose low quality and aesthetic neglect have been described as “imminent architecture.” The idea is that these churches were built as if their members believe Christ will return shortly. If you are expecting an imminent Second Coming, you certainly are not going to build for the ages. This is especially true in the dispensationalist view, which interprets scripture as saying this world will be physically destroyed and the new heavens and earth created ex nihilo. 4. A lack of connection to the transcendent. In the dualistic worldview, the transcendent is experienced through spiritual activities such as prayer or charismata, not physical means. But the entire concept of the transcendent—that is, connecting to something beyond or bigger than ourselves, our surroundings, and our present existence—is increasingly missing, not just in Protestantism, but in America at large. Sociologists Christian Smith and Melinda Lundquist Denton surveyed American youth regarding their spiritual beliefs. They discovered that teenagers believe God exists, wants them to be good, and wants them to be happy and fulfilled, but is largely distant from and uninvolved in the world. They labeled this view “Moralistic Therapeutic Deism.” It is prevalent among adults as well. The absence of the experience of God in this worldview unmoors its adherents from the transcendent. So too a focus on personal self-fulfillment in the now, which is practically the definitional opposite of transcendence. When a connection to the transcendent is unvalued or is of a purely spiritual nature, clearly a core function of sacred architecture is lost. The great cathedrals of Europe, for example, almost literally draw one’s eyes towards heaven. Their scale suggests the immensity of God and the Church of which we are a part. 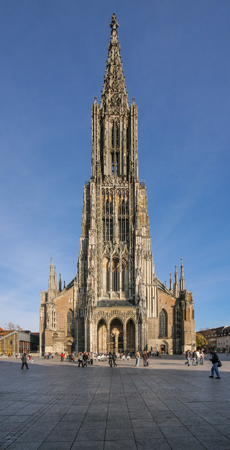 The consistent use of Gothic architecture through the centuries suggests a connection to a Church that transcends time. Their very design (e.g., stories in stained glass) proclaims the telos of creation—namely, the Gospel. With functions like these no longer seen as important, sacred architecture necessarily suffers. 5. Cultural adaptation—rationalism. Evangelical Protestantism has also heavily adapted itself to modern culture, often intentionally for missional purposes. Contemporary culture is rationalistic, industrialized, pragmatic, consumer-oriented, leveling, and informal. Rationalism today tilts towards philosophical materialism and denying the existence of the spiritual. This actually reinforces belief in spiritual-physical dualism precisely because atheistic materialism says there is no possibility of embodied spirituality. Rationalism also tends to devalue primal spiritual needs, such as that for sacred space, as relics of a more primitive era. It is a modern conceit that our civilization stands at the apex of human evolution intellectually, economically, politically, socially, and morally. The need for truly special sacred space is rejected because it is perceived to be ancient, obsolete thinking. The modern disconnect from the past and refusal to see ourselves as a link in a chain of humanity extending forward and backward in time is itself an anti-transcendent viewpoint. While modern Protestantism largely rejects the idea of man’s moral evolution, the rest of this has been adopted wholesale. 6. Cultural adaptation—consumerism, pragmatism and industrialization. Modern culture pragmatically values catering to personal needs through uniform, mass-produced products that are functional and low cost. This is evident from, for example, our tract homes and strip malls. Style and design are valued mostly to the extent that they enhance personal status (e.g., luxury brands). Modern Protestantism, especially Evangelicalism, has adapted to this culture. This manifests itself through items such as high production values, contemporary music, and satisfying the desire for programs. 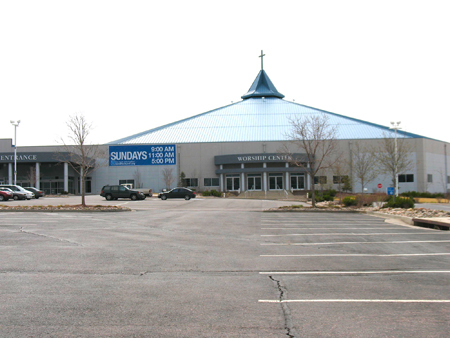 These churches can partially be seen as vendors providing an array of popular services. Some of this has been an explicit strategy intended to attract the unchurched. Our consumer-oriented society eagerly buys industrialized, secular products and services from vendors housed in low-grade architecture. Building a high quality church would require doing something different and potentially spending extra to do so. Why would a consumer-oriented church do this if the market does not demand it? It will not. Many such churches are thriving with the status quo, so they have no impetus for change. That is doubly true when many churches with traditional sacred architecture, both Roman Catholic and Protestant, are shutting down, and many of their buildings are either being demolished or converted to non-religious use. 7. Cultural adaptation—leveling. Alexis de Tocqueville contrasted the democratic social state in America with the aristocratic one in France, noting that while the average condition in America was better, its culture had a leveling effect that pulled down the peaks of human accomplishment, including artistic ones. Our society has tended to erase distinctions (especially between high and low as categories), treating everything as common. The message of the Gospel has an even more radical unity of man and erasing of distinctions in Christ. But while our culture has not gone far enough in mimicking the unity of the church, it has gone too far in eliminating legitimate distinctions, including those of sacred architecture. Protestantism has tended to embrace this more than Roman Catholicism, possibly because the latter has a stronger conception of things set apart for God, such as the unique role of its priesthood. 8. Cultural adaptation—informal liturgies. The Roman Catholic Mass employs a standardized, stylized, and formulaic liturgy that has effectively become integrated with an architecture that evolved to support it. Some Protestant churches use a traditional liturgy, but many do not. 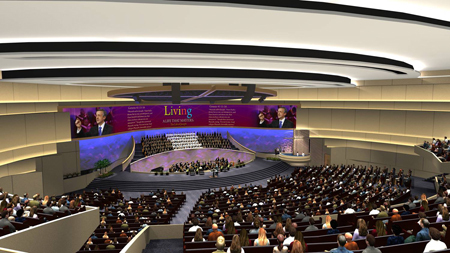 Modern churches often employ contemporary, informal liturgies oriented around the musicians and preacher, where liturgical needs are well served by a simple auditorium that does not distract from the people on stage. All of the above items are interlinked and mutually reinforcing. Modern Protestantism tends to de-emphasize the church, the physical, place, and the transcendent while adapting to contemporary culture and heavily focusing on the return of Christ. Unsurprisingly, this has led to low-quality sacred architecture. Some of these affect the Roman Catholic Church as well, but its sacralization of tradition and the requirements of its liturgy have preserved architectural practices that might otherwise have faded. This has not stopped its loss of adherents in the United States, however, which can suggest to Protestants that traditional sacred architecture is not attractive. 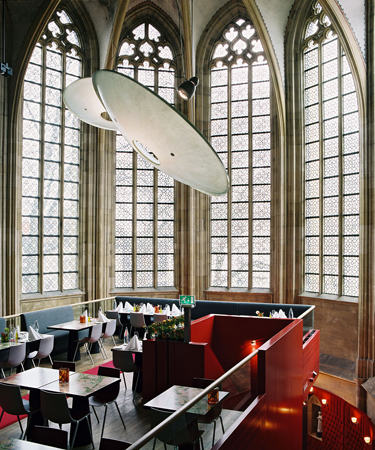 In a society that is increasingly abandoning faith, architecture may not be the top concern. But as the Westminster Shorter Catechism says, “Man’s chief end is to glorify God, and to enjoy Him for ever.” That call is to glorify God in all that we do, not just through special spiritual practices. I hope that we Protestants will rediscover how to glorify Him in our buildings, recognizing them as an integral part of our worship. Let us do that without neglecting to glorify Him in our hearts, actions, and every other aspect of life as well. Aaron M. Renn is an urban analyst whose writings appear at the Urbanophile (www.urbanophile.com») and elsewhere. He is also the founder of the urban data analytics service Telestrian (www.telestrian.com»). Special thanks to Todd J. Murphy and Dwight Gibson for their comments and contributions to this article.